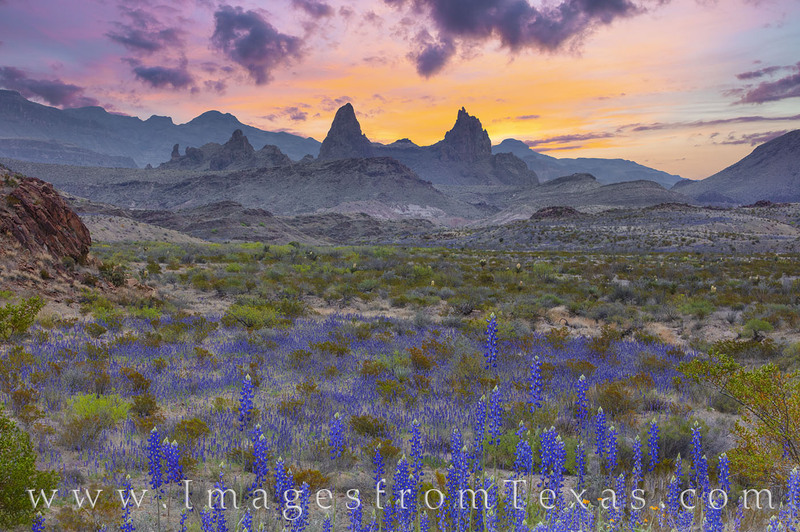 With bluebonnets at peak bloom in Big Bend National Park, this view shows the iconic land formation - the Mule Ears - on a cool March morning. This photograph was a blend of several images taken with a telephoto lens, then stacked together to achieve maximum sharpness and clarity. The morning was calm, and low clouds would soon move across the Chisos Mountains, leaving a gray, overcast sky. But for a few moments, soft shades of orange and pink painted a sky overseeing a beautiful and rugged bluebonnet landscape. Photo © copyright by Rob Greebon.